Easter is the celebration of Jesus’ resurrection on the third day after his crucifixion. It is one of the most important days in the Catholic calendar and is the foundation of the Christian faith. Easter is the fulfilled prophecy of the Messiah who would be persecuted, die for our sins, and rise on the third day. The week leading up to Easter is called Holy Week. Holy Week begins on Palm Sunday and ends at the Vigil Mass on Easter Saturday. 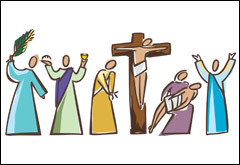 The events of Holy Week are recorded in the Gospel accounts of Matthew, Mark, Luke and John. From these accounts, it is possible to put together a timeline of events in the week preceding Jesus’ death. On Tuesday, Jesus was preaching to the people in the temple when the chief priests and the scribes came up to him to question him. They asked him what authority he had to be preaching his gospel. Jesus answered them by telling them several parables. On Wednesday, Judas Iscariot decided to betray Jesus. Judas received thirty silver coins for betraying Jesus. Then one of the twelve disciples—the one named Judas Iscariot—went to the chief priests and asked, “What will you give me if I betray Jesus to you?” They counted out thirty silver coins and gave them to him. From then on Judas was looking for a good chance to hand Jesus over to them. After eating, Jesus and his disciples went to pray in a place called Gethsemane. Jesus, knowing what was about to happen to him, prayed in anguish to his Father. When he returned to his disciples, he found them asleep. While he was speaking to his disciples, Judas arrived with a large crowd who were armed with swords and clubs. With a kiss of betrayal, Judas showed the soldiers who Jesus was and Jesus was arrested. On Friday, Jesus was sent before the chief priests, Pontius Pilate and Herod as he endured several trials. Pilate tried to compromise with the religious leaders by having Jesus beaten, but this did not satisfy them, so Pilate handed Jesus over to be crucified. Jesus was dressed in a purple robe and a crown of thorns. He was made to carry his own cross to the place of the skull, known as Golgotha. Here, Jesus was crucified alongside two other criminals. It is believed that Jesus hung alive on the cross for up to six hours. Right before his death, at three o’clock, he cried out, ‘My God, my God, why have you abandoned me?’ Then Jesus gave aloud cry and breathed his last breath. Jesus was taken down from the cross and wrapped in cloth. His body was placed in a tomb belonging to Joseph of Arimathea. On Holy Saturday, Jesus’ body lay in the tomb. On Easter Sunday, Jesus rose from the dead! Look out for ‘The Events of Easter – Part Two’ for details of Easter Sunday.